What’s the Main Difference between Salted Butter and Unsalted Butter? Clearly, the most notable difference between salted butter and unsalted butter is the presence of salt in the former. While most unsalted butter is 100% cream, salted butter will have some salt added to it. The exact amount of salt present in the butter will depend on the brand. Salted butter also lasts longer in the refrigerator, since salt acts as a food preservative. According to the National Dairy Council, salted butter can last up to two months in the fridge, while unsalted butter will probably last for just two weeks. So, the unsalted butter sitting on the shelf at your favorite grocery store is probably fresher than the salted variety. Another issue with salted butter is the uncertainty about how much salt it contains, which means you have no control over your intake. You can use salted butter for any purpose. It’s an ideal spread for breads and a great topping for pasta and veggies. You can use it in recipes when you’re not so concerned about controlling the amount of salt in the recipe. Some use salted butter to add a special flavor to the dish they’re preparing. Make your breakfast interesting by spreading a bit of salted butter on your morning whole grain muffin. You’d be surprised at how quickly it can turn your ordinary boring breakfast into a delicious yet healthy treat. A teaspoon of butter only has four grams of fat, and it really enhances the flavor. Using unsalted butter gives you complete control over the overall flavor of your recipe. This is particularly important when baking sweets like cakes or cookies, where the unadulterated sweet cream flavor of butter allows the natural sweetness of your ingredients to come through. Some recipes call for using unsalted butter and then adding salt. This helps you to avoid clashing certain flavors, and you can get the right balance between savory and sweet by adding the exact amount of salt you want in the recipe later. Salted and unsalted butter have nearly the same components and nutritional value, but there are certain differences. Salted butter contains vitamin D, while unsalted butter does not. Salted butter has the amino acid betaine, but unsalted butter does not. However, they have the same number of calories (1,628) each. Drop a marble in a glass jar. Fill half the jar with cream and close the jar with a lid. Shake it for a while. After removing the marble, whisk the contents in a bowl so that they separate into buttermilk and butter. Strain the buttermilk using a sieve. The butter will look a bit like scrambled eggs. Rinse the butter in cold water so that it doesn’t go rancid. Knead well, dry the butterball, and add salt in the center. Knead until the salt mixes well with butter. Pour the heavy cream in the bowl of your electric mixer, and whip the cream on high speed. Don’t stop whipping it until the fats in it separate from the liquid and stick to the whisk, for at least five minutes. Next, transfer the solid fats (the butter) into a cheesecloth. Squeeze out the remaining liquid, then rinse it under cold water; squeeze again. Then remove the butter from the cheesecloth and refrigerate it until you are ready to use it. We noted earlier that a big difference between salted and unsalted butter is that salted butter actually lasts longer. By soaking up any excess moisture, which bacteria need to thrive and multiply, salt will keep the butter “fresh” for up to three or four months longer than its unsalted counterpart. Although the three-month-old butter will still technically be good for cooking, for baking, you should really use fresh, unsalted butter. The salt will sometimes mask the taste of rancid butter, but your baked foods will always taste better if you use fresher ingredients. In some cases, you can get away with substituting salted butter for unsalted butter, such as when baking a flaky, butter pie crust. This depends on individual opinion and will always be a matter of contention for everyone. In fact, the first time you try unsalted butter, you probably won’t like it. The taste is noticeably different without the salt, and since it goes bad sooner, you should definitely taste it before cooking or baking with it. It takes some time to get used to the taste of unsalted butter. Once your taste buds are on board, you might actually prefer unsalted butter. Fortunately, most commercial brands produce both salted and unsalted varieties of their product. So you shouldn’t worry about switching to a new brand if you decide to lose the salt. Most people love the taste of salted butter and it has more vitamin D when compared to unsalted butter. It can enhance your savory dishes, and it can be stored for a long time as well. Increasing Your Cholesterol Levels – Salted butter is a high-fat dairy item and has long-chain saturated fats such as myristic acid and palmitic acid. Saturated fats are known to boost the body’s production of low-density lipoprotein (LDL or “bad”) cholesterol and increase the cholesterol levels in the blood. Boosting Your Risk of Coronary Illness – Studies have demonstrated that high-sodium, high-fat items like salted butter can increase the risk of heart disease. They do this by increasing the serum lipid and sodium levels, which can in turn increase the threat of heart issues like high cholesterol and high blood pressure. People with coronary illnesses should not consume salted butter and should also reduce their intake of low-fat dairy items. Increasing Your Overall Sodium Intake – People who suffer from diseases of the liver and kidneys should also avoid consuming salted butter. Salted butter contains higher amounts of sodium, which can be damaging for people with such ailments. They can consume unsalted butter in moderation. Hypertension – People with hypertension or high blood pressure are advised to reduce their sodium intake, which means that salted butter is not a good choice for them. One serving (7 g) of salted butter contains 42 mg of sodium. So people with hypertension should avoid salted butter altogether. Richness in Fat-Soluble Vitamins – Unsalted butter from grass-fed cows is a great source of fat-soluble vitamins A, D, and K2. These are very important for the human body. Trace Nutrient Content – Unsalted butter is an excellent source of vital trace nutrients such as chromium, copper, iodine, manganese, and zinc. Potential Reduced Risk of Heart Diseases – Surprisingly, many studies have shown that saturated fats are not connected to cardiovascular diseases. Some research has even shown that people who consume margarine regularly because they view it as a healthy food are far more likely to develop heart diseases than those who eat unsalted butter. Pure Fat Content- Unsalted butter is derived from milk fat, and a single tablespoon has 100 calories. So whenever you consume it with your foods, be careful of the amount you are using. 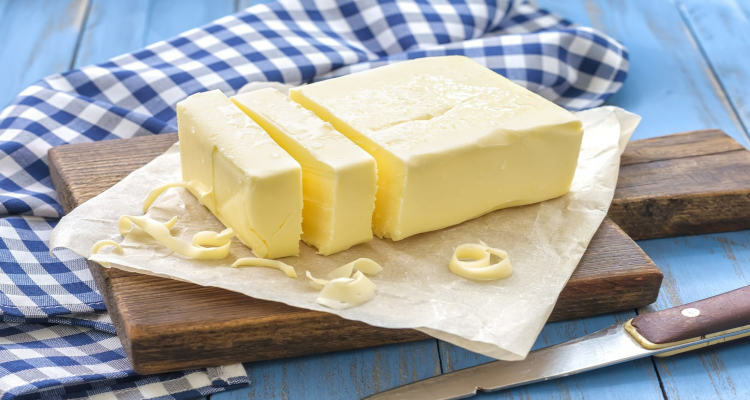 Overconsumption Can Raise Your Bad Cholesterol – The Heart Foundation states that butter is 50% saturated fat and four percent trans fat. Eating a lot of saturated fat increases your blood cholesterol, especially the bad (LDL) cholesterol. Cooking with butter from grass-fed cows is fine, but it’s essential to use it in moderation. Too much can lead to obesity and other health problems. Whisk the butter, granulated and brown sugars, and vanilla with an electric mixer until light and fluffy. Add flour and mix until combined. Add chocolate chunks and mix. Divide dough between two sheets of waxed paper and use your hands to form the dough halves into logs about two to two-and-a-quarter inches in diameter. Chill until totally firm, about two hours. When you’re ready to bake the cookies, heat the oven to 350 degrees F. Line two large baking sheets with parchment paper. Lightly beat the egg and unwrap the chilled cookie logs to brush it over the sides. Sprinkle the coarse sugar on the open wrapping and roll the logs into it, coating them. Cut logs into one-half-inch-thick rounds. Arrange cookie slices on prepared baking sheets one inch apart and sprinkle each with a few flakes of sea salt. Bake until the edges get golden brown for 12-15 minutes. Let cool slightly before serving. Combine one-third cup of brown sugar and one-quarter cup of butter in a bowl. Beat at medium speed, until creamy. Add bananas, egg, and vanilla; continue beating until well mixed. Place one cup of flour, baking soda, cinnamon, and salt into another bowl. Stir the flour mixture into the banana mixture until moistened. Spoon batter evenly into 12 paper baking cup-lined muffin pan cups. Combine all streusel ingredients except chocolate chips in a bowl; mix well. Stir in chocolate chips. Spoon evenly over top of muffins. Bake for 18-25 minutes until light golden brown. Let it set for five minutes; remove muffins from pan to cooling rack. The main difference between salted butter and unsalted butter is, of course, the salt content. Moreover, a lot of people find salted butter to be tastier than unsalted butter. Since salt is a preservative, salted butter can also last much longer than unsalted butter, which might go bad if stored in the fridge for longer than two weeks. However, salted butter has several potential disadvantages, like increasing the “bad” cholesterol levels in your body, increasing the risk of coronary illness, upping your overall sodium intake, and increasing your risk of hypertension. On the other hand, there are several advantages of consuming unsalted butter, such as it being rich in fat-soluble vitamins, containing important trace nutrients, and possibly reducing the risk of heart diseases. You must consume unsalted butter in moderation, however, to avoid its disadvantages like excess fat content. You can use both salted and unsalted butter to make delightful desserts for your family and friends. Try making some chocolate chunk shortbread with salted butter or salted butter apple galette with maple whipped cream with dollops of salted butter. You can make wonderful dishes with unsalted butter as well, like chocolate banana muffin-streusels and dark chocolate lemon pixies that will have guests eating out of your hands. As to the question, “Which is better: salted butter or unsalted butter?” we leave it to you. It’s your personal health needs and tastes that will guide your buying decision. https://www.tasteofhome.com/article/salted-or-unsalted-butter/, last accessed November 2, 2018. Webber, R., “How Much Salt is in Salted Butter?” Chowhound, March 6, 2009; https://www.chowhound.com/food-news/54962/how-much-salt-is-in-salted-butter, last accessed November 2, 2018.
https://www.landolakes.com/expert-advice/salted-or-unsalted-which-butter-should-i-use-when/, last accessed November 2, 2018.
https://nutritiondata.self.com/facts/dairy-and-egg-products/0/2, last accessed November 2, 2018.
https://nutritiondata.self.com/facts/dairy-and-egg-products/133/2, last accessed November 2, 2018.
https://snapguide.com/guides/make-homemade-salted-butter/, last accessed November 2, 2018.
https://tastykitchen.com/recipes/homemade-ingredients/homemade-unsalted-butter/, last accessed November 2, 2018.
https://www.bobsredmill.com/blog/healthy-living/salted-vs-unsalted-butter/, last accessed November 2, 2018.
https://1md.org/article/which-butter-is-better-salted-or-unsalted, last accessed November 2, 2018.
https://www.healthlogus.com/disadvantages-of-salted-butter/, last accessed November 2, 2018.
https://www.healthymummy.com/butter-healthy-not/, last accessed November 2, 2018.
https://www.foodnetwork.com/recipes/salted-butter-chocolate-chunk-shortbread-5418416, last accessed November 2, 2018. “Chocolate Banana Streusel Muffins,” HealthBenefitstimes.com, https://www.healthbenefitstimes.com/unsalted-butter/, last accessed November 2, 2018.